Some 7,500 people attended the second annual Wine HK event on Hong Kong’s Central Harbourfront last weekend, December 5th to 7th. Adjacent to the new Hong Kong Observation Wheel, the site and setting was something to behold. The iconic skyline from Two IFC to Wan Chai’s Central Plaza wrapped around the land side; Kowloon visible across Victoria Harbour on the other. So far, so visually impactful – so how was the wine? 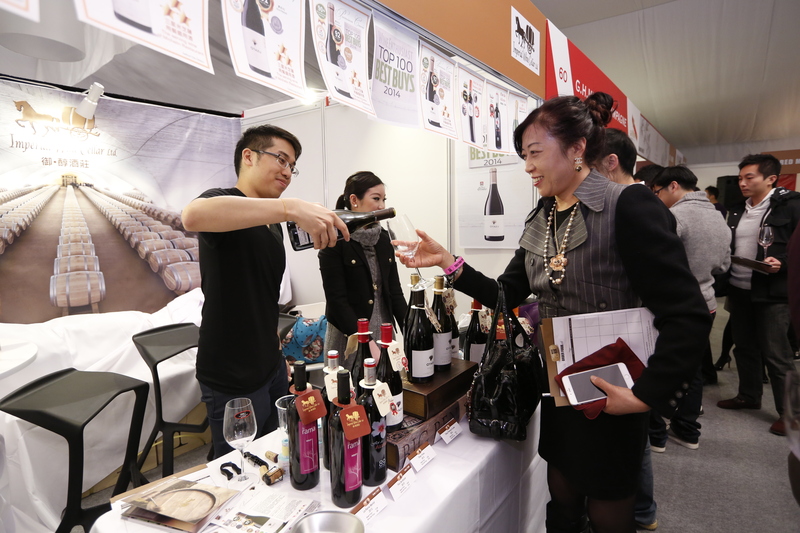 Wine consumers make the most of the pop-up selection of discounted wines last weekend at the second Wine HK event. Asian Palate visited on the opening night and noted how much variety there was. Being a consumer event, lots of known labels were represented at the 90 booths, but there were also a number to surprise some visitors. Howard’s Folly – Portuguese whites and reds with a connection to Hong Kong: owned by a local businessman, who founded an art foundation, through which comes some eye-catching labels. The Reserva 2008 blend and Sonhador Alvarinho Blanc 2011, though, carried more weight than decorative design. British sparkling wine, continuing to perform well and draw curiosity at international tastings, also appeared. Heavyweights in sparkling and still from France, Australia and a few other wine-producing regions also showed. The selection from local distributors was curated by Australian wine critic Jeremy Oliver, who was also involved in the inaugural event last year. In addition to enjoying a 20 per cent discount on all wines at the show, attendees voted for their favourites of the more than 800 wines being poured, through the Riedel People’s Choice Awards. Best Champagne or Sparkling Wine: Chiaro Prosecco. Best Red under HK$100(US$13): Zonin, Montepulciano d’Abruzzo, I Classici 2012. Best Red HK$100-300 (US$13-US$39): Punt Road Cabernet Sauvignon 2012. Best White Under HK$100: Daniel Riesling off-dry 2013. Best White HK$100-HK$300: Siener-Schiefer 2012. Sales taken over the weekend were in excess of HK$3 million (US$387,000). The event was considered worthwhile by vendors who spoke with Asian Palate, and seemed highly accessible to the public.